"This is super easy to prepare, especially if you are using prepared pastry tart shells. Even when I only have a few minutes I can still prepare something home-baked. It will be hard to keep these around for too long. My boys ask for them often." Preheat oven to 400 degrees F (200 degrees C). Place tart shells on a baking sheet. Whisk brown sugar, butter, and vanilla extract together in a bowl; whisk in egg until smooth. Stir half-and-half into sugar mixture. Fill prepared tart shells 2/3-full with filling. Bake in the preheated oven until filling is bubbly and pastry is golden, about 15 minutes. Add raisins or nuts as preferred. 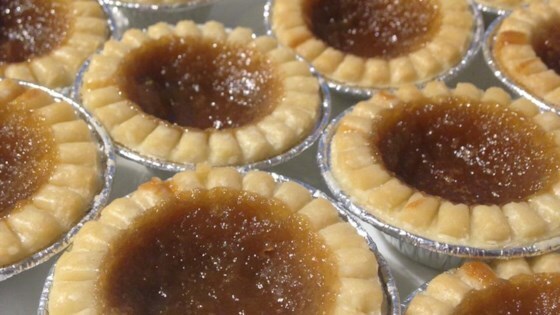 Best and easiest butter tart recipe around. Thanks, Sandra. Easy recipe! Rave reviews on the 4 batches of this recipe!! Not so very sweet.. they were a hit! These turned out great only thing I changed in this was instead of using half&half I used heavy cream the whipping this is a great option for those who don't like raisins in their butter tarts !